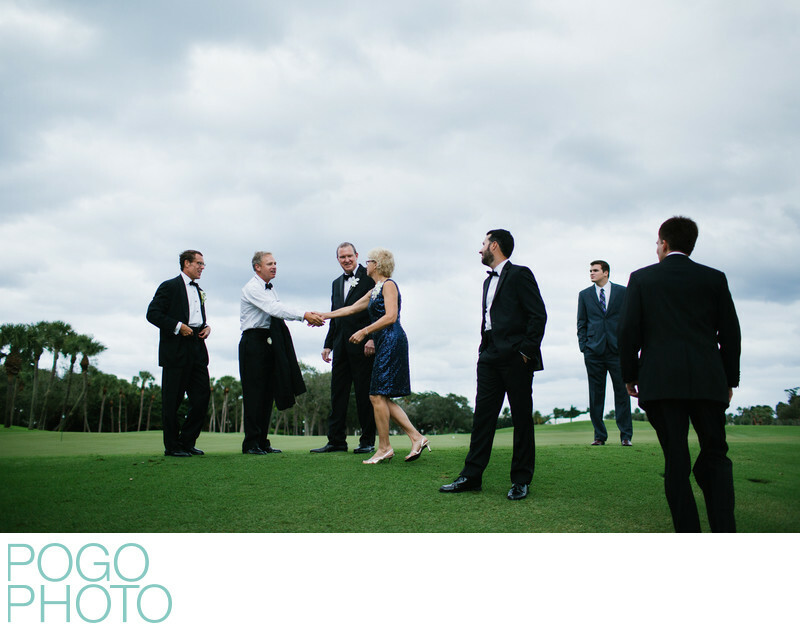 Documenting the entire wedding day is a task for an experienced professional photographer; catching small moments such as this one, when two families met for the first time during the family formals, is part of what makes us an ideal choice for your Palm Beach wedding photography. With a sharp eye for detail and our attention always on the interactions between the people involved in the day, we work seamlessly with our equipment and each other to be sure that the day's moments are captured. Culturally a wedding is the joining of two families as their children create their own family branch, and in most cases these families have met during prior celebrations. When families from two different parts of the country come together for a destination wedding it can be a fascinating scene to document, and serves to make the wedding coverage that much more thorough. Weddings at the exclusive Lost Tree Club in Palm Beach Gardens, Florida, have the advantage of sweeping golf courses, ocean access, and a small chapel perfect for celebrations that are all in one location. The stormy weather on this wedding day didn't detract from the feeling of festivity, with everyone involved excited to witness the ceremony and celebration of a couple very much in love. Location: Lost Tree Club, 11520 Lost Tree Way, North Palm Beach, Florida 33408. 1/320; f/2.0; ISO 400; 35.0 mm.